Updated Monday April 23, 2018 by MLL. No inning may be started 1:45 minutes after the start of the game. (e.g. for a 5:45 p.m. start, no inning shall be started after 7:30 p.m. There is a 4 inning minimum for all players to play, unless they refuse to go out. All players will be rotated between infield and outfield positions. They must play a minimum of 2 innings in the outfield. Pitcher and catcher are considered to be infield positions. 4 outfielders are allowed on the field. Defensive players must play “normal” positions. No Shifts. Outfielders must be positioned a minimum of 10 feet from the edge of the grass separating the infield from the outfield. Infielders may be positioned no closer to the plate than one (1) step in on the infield grass. Outfielders are not permitted to make plays in the infield. When fielding a ball, outfielders must throw the ball to an infielder. Outfielders are not allowed to cover infield bases. The Outfielder has to field the ball on the outfield grass. There is free substitution with a perpetual batting order. At the beginning of each game, the batting order will pick up where it left off in the previous game. An inning will consist of 3 outs or 9 batters or 5 runs or whichever comes first. The strike zone is from the shoulders to the knees. There is no bunting, stealing, leading (runners must be on the base when the ball is hit), or running on wild pitches. Runners may not advance on an overthrow of any base. The ball is dead once a ball thrown into the infield from the outfield breaks the plane established by the edge of the grass separating the outfield from the infield. Runners half way or more toward the next base when the ball crosses the plane may advance to that next base, while those who are less than half way must return to the previous base (this is at the discretion of the umpire). The team at bat is responsible for providing a coach to backup the catcher (not a player or a young child). This individual will be positioned at the backstop to retrieve wild pitches and passed balls. Adult base coaches are allowed on both 1st and 3rd base. The fielding team may have one coach in the outfield. Games will end in a tie if the score is tied after the completion of four (4) or more innings and the game could not be continued at the time due to darkness, inclement weather, or curfew. Tie games may be suspended due to a passing shower if they can be completed later that day. Little League rule 4.10(e) shall apply. 4.10(e) If after four (4) innings, three and one-half innings if the home team is ahead, one team has a lead of ten (10) runs or more, the manager of the team with the least runs shall concede the victory to the opponent. NOTE: (1) if the visiting team has a lead of ten (10) runs or more the home team must bat in its half of the inning. There will be no forfeits except for failure to field enough players within 10 minutes of the game time, or for deliberate violations of the rules, which will be determined by the Board of Directors of the league excluding managers, coaches, or relatives of players involved or teams affected. Games can be played with eight (8) players. In regards to coach conduct, there is a zero tolerance policy toward arguing with an umpire. The pitcher’s rubber will be located 44’ feet from home plate and the pitcher has 3 feet leeway from the rubber to home plate. MLL Kid Pitch follows Little League Green Book pitching rules, for 7-8-year-old players. Even if a player is over league age 8 that player is capped at 50 pitches. Once the pitcher has been removed s/he cannot go back into the game as a pitcher. The player may only go into the field or sit on the bench. Pitch counts and game scores must be submitted to the league website by both managers within 24 hours of completion of that game. Batters will be awarded first base on 4 balls. Once the bases are loaded the batter will walk after 6 balls are called. However, if the batter is struck by a pitched ball s/he will be awarded first base and a run will be scored. The 9 batter maximum rule remains in effect. The playoff rules are the same as the regular season rules. In the last inning or extra innings there will be no 5 run and/or 9 batter maximum rule in effect. However, the 1:45 minute game rule will still be enforced. The 1st and 2nd place teams at the end of the regular season will receive a first round bye. The 3rd place team will play the 6th place team and the 4th place seed will play the 5th place team in the first round. The lowest seeded advancing team will play the 1st place team and the next lowest seeded advancing team will play the 2nd place team in the second round. The championship game will be between the winners of the second round games. Managers and coaches of the Federal League All-Star team will be determined by the standings as of Saturday, May 26, 2018. 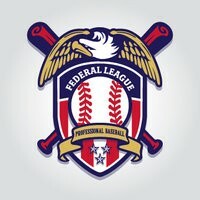 The manager of the 1st place American League team and the manager of the 1st place National League team will be managers of each respective Federal League All Star team. The American League All Star team and the National League All Star team will play on a date set by the board of directors prior to the start of the season. The manager of each All-Star team may pick his/her own assistant coaches and should give preference to other Federal League managers as assistant coaches. Four total coaches per All-Star team are allowed.